The desire to adorn is ancient and universal. For thousands of years, jewelry has been a form of exuberant cultural expression, as currency, religious symbol, garment closure or display of status. We're amazed by artisans' resourcefulness. In addition to shells, semi-precious stones, bone and metal, they fashion adornments from paper, cans, wire, rubber, grass and glass. Jewelry reflects contact between different cultures. New materials, such as recycled paper beads, are quickly embraced and integrated. Motifs and techniques are tried and adapted. What might have started as a simple copy of work from another culture quickly evolves into a new, singular style. At Crossroads Trade, our jewelry becomes your personal symbol, a reflection of your style, a remembrance of your travels, your connection to your heritage. Above all, it speaks to your commitment to fair trade – to ethical employment, to economic empowerment. Your purchases enable Kenyan and Nepalese mothers to send their daughters to school. South African children, orphaned by AIDS, receive care and shelter. Colombian artisans produce jewelry, instead of cocaine. 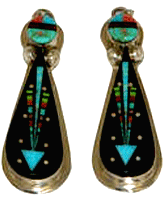 American Indian silversmiths maintain their traditional motifs and techniques, while earning a livelihood. Our stock of jewelry changes constantly, so please check these pages often. This month, we're featuring work of South Africa, Nepal, Costa Rica, Colombia, Kenya, Israel, various U.S. Indian tribes and Guatemala. 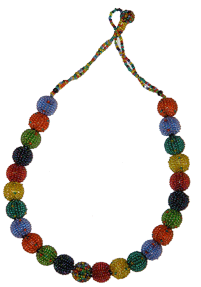 Our South African offerings feature stunning beadwork from a project that both provides fair wage employment and supports an orphanage for children of AIDS victims in KwaZulu Natal. The beaders work from home, enabling them to care for their children. The beadwork project now also supports an after-school enrichment program for children, providing them with knowledge and life skills to move out of poverty and prevent HIV. We have several sources of Nepalese jewelry. Our contemporary beadwork is designed and produced by a fair trade company with 12 years of on-the-ground experience. 50 of the original 75 women are still working with the company. 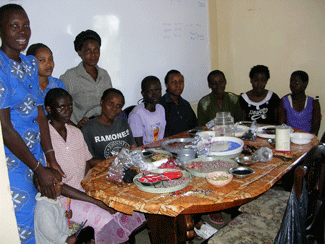 With their earnings, they have been able to send their daughters to school. Their social status has improved as well, making their quality of life better, overall. We also carry jewelry made by Tibetan refugees, living in Nepal and Northern India. 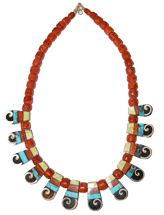 Much of it is traditional Tibetan work, in silver, turquoise and Himalayan coral. The artisans also work in bone, shell, recycled metals and other materials at hand to make spectacular, drapey necklaces and bracelets. Most of Crossroads Trade's Kenyan jewelry is made by women on the Kenyan coast, working to earn tuition for their daughters' schooling. (Here, as in many countries, schooling for girls is often a lower priority than schooling for boys). The women use recycled materials, such as furniture polish cans and glass beads, as well as natural materials, such as bone. Costa Rica's primary natural material is wood. We recently found a fair trade company, using sustainably produced tropical woods to make bold, contemporary jewelry. The company employs upwards of 250 people to harvest the wood, fashion the beads and produce the jewelry. Our Colombian jewelry uses sustainable materials as well. The tagua palm produces rock-hard nuts with ivory-like properties. 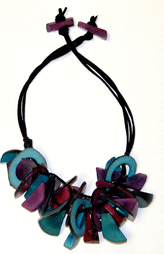 The artisans cut the tagua nuts into wonderful shapes, which are dyed with materials such as leaves and berries. Recently, the artisans have found new ways to cut the tagua, significantly reducing production costs. We're pleased to be able to offer our tagua at much lower prices than we were able to a year ago. Crossroads Trade offers Israeli jewelry from two sources. Several years ago, we found an 8th generation silversmith, carrying on his family's traditional Yemenite filigree tradition. We recently added contemporary cut-stone work made by a recent immigrant to Israel from the Crimea. As he explored his new country, he found spectacular minerals and rock formations in the Negev. His experiments led to a line of jewelry, emphasizing the natural characteristics of each stone used. He now uses materials from all over the world in his pieces. We are actively looking for new sources of fairly traded jewelry. If you have suggestions, please e-mail us.